才能あるクリエーター達が共同体として活動することで、経済的だけでなくクリエイティブにおいても高いレバレッジ効果を狙い、豊かな創造力に支えられた個人の可能性と、作品力の向上に繋がる作家性を昇華させ、既存の枠にとらわれない映像コンテンツを全世界に向けて発表する基盤を作り上げるという理念をもとに、 完山京洪、山本兵衛、デボラ・バリヤスが2011年1月に設立した会社。 What's most important in filmmaking and fatally deficient in Japanese films today is a singular vision that anchors and commands the film, a vision that belongs to a director, or a well-crafted script, or strong performances that infuses authentic emotional credibility. All the filmmakers, including directors, producers, writers, cinematographers, and actors are responsible to contribute to that vision. It is our goal to achieve a kind of filmmaking that demands all the creators to share their vision and that is why we have launched a new production company Vesuvius. Welcome to a crowd funding project page for SEESAW! Praised as “promising feature debut” by the Hollywood Reporter, SEESAW directed by Keihiro Kanyama screened at over 10 international film festivals, picking up awards and accolades all over the world. Vesuvius, a production company launched by Keihiro Kanyama and two other partners are self-distributing the film in Japan during early summer 2012. And we need your support to successfully distribute the film in Tokyo and other cities across Japan, so that the film reaches the audience that the film truly deserves. So please make a pledge in the amount listed in the column on the right. Contribution of any amount is greatly appreciated! Our goal is to raise 500,000 yen within 30 days. Once you click the pledged amount, you will be prompted to log in via your Facebook account, then you will be able to make a payment via Paypal in Japanese yen. SEESAW will be screened with English subtitles, so please join us at the theaters near you! Surrounded by good friends with a rewarding job and a non-committal relationship with an easy-going boyfriend, Makoto (Maki Murakami) lives a fulfilled life. Or at least she thinks so until she loses balance and suddenly finds herself plunged into chaos. 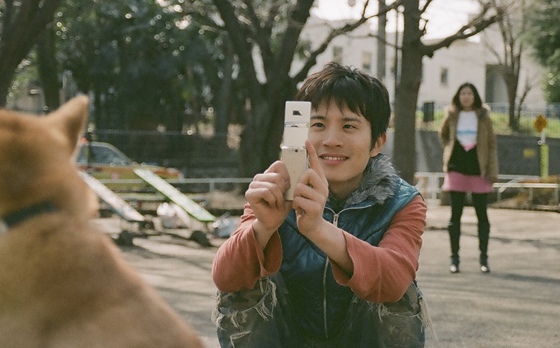 SEESAW delicately depicts growing doubts and freewheeling emotions of young professionals living at the heart of Tokyo. The film, a passion project for the cast and crew, was produced with a shoestring budget financed by themselves. Upon its completion, the film premiered at SKIP City International D-Cinema Festival winning SKIP City Award and went on to screen at Vienna International Film Festival, Hawaii International Film Festival, and many more, garnering fabulous reviews and critical acclaim. Murakami began her modeling career at the age of 19 and sine then has appeared in many commercials and magazines. She has begun acting on stage at 25 and made her big screen debut with SEESAW. SoRA is a singer and a musician performing as AnisHyssop, fuaim, Visions and Wild Bird and other bands. She landed her role in SEESAW when she was introduced to the director by her friend. Oka has performed in various films including REVIVAL BLUES by Claude Ganion, FUJIYAMA NI MISSILE by Oka Fagaku, and WARU by Miike Takashi. Kanyama began his career as an actor and starred in Tom Pierson's TURKEY BOY. His feature directorial debut SEESAW, which he produced, wrote, and starred in, won the SKIP City Award at SKIP City International D-Cinema Festival 2010 and screened at more than ten international film festivals. He was selected for Next Masters, a workshop for up and coming 20 Asian filmmakers organized by Tokyo Filmex, and presented his feature project under the supervision of Hsiao-hsien Hou. His next project is PARAMEDIC, a short film he wrote and directed. Nishida has been shooting since he was in his teens. After volunteering as a teacher in Morocco, he began shooting for film, TV, and commercials. His credits include MISUTERU KOKORO, SAFARI, MARIANNE NO MAISO, 2028 BELIEF, SEESAW, and PARAMEDIC. You will receive a personal letter of appreciation from the director plus an access to exclusive Backers Update on the Wall section. You will receive a personal letter of appreciation from the director plus an access to exclusive Backers Update. Cast and crew of SEESAW will consult you on any problems you would like to share over coffee and desserts.